Fulfilling its mission to serve people in need — wherever they may live — The Bayat Foundation, Afghanistan’s leading health and social development organization, completed a three-day hearing care mission April 18-20 in the Dominican Republic in support and sponsor of the Starkey Hearing Foundation. The senior leadership of the Bayat Foundation volunteered to give the gift of hearing to people in need. Dr. Ehsanollah Bayat, Chairman, and Ms. Leah Bayat of the Bayat Foundation joined the Starkey Hearing Foundation’s hearing health specialists and mission team to provide hearing health care to more than 1,200 people living in the cities of Santo Domingo and Santiago de los Caballeros. Joining the Bayat and Starkey Hearing Foundation service teams was world champion boxer Evander Holyfield who inspired the patients to achieve their potential. Following the Santo Domingo hearing mission, the mission team traveled to Santiago de los Caballeros, the capital of Santiago Province. There, from April 19-20, the mission team established a Hearing Health Care Center at the Pontificia Universidad Católica Madre y Maestra, and provided hearing devices for more than 350 people living in Santiago de los Caballeros and the surrounding area. The ages of the patients ranged from one year of age to 115 years old. A survey of the patients in Santo Domingo and Santiago de los Caballeros, indicated that 35 percent didn’t know the cause of their hearing loss and about 24 percent of the patients had experienced hearing loss at birth. In each location, the hearing mission team — supported by scores of local volunteers, utilized a meticulous intake process, which prepared each patient to receive the most appropriate and effective type of hearing care. The intake process included recording the name, residence and vital statistics of each patient, conducting an examination cleaning of the ears and auditory system. Then each patient was fit with a set of ear molds — clear, wear-resistant plastic discs used to house the hearing aids provided without cost to each patient. After completing intake, volunteers escorted each patient into the treatment area, where the Bayat and Starkey hearing care teams, together with specially trained volunteers fit each patient with the hearing devices that empowered each patient — many for the first time in their lives — to use the precious, powerful gift of hearing, sound and their voices to connect with their families, their communities and the world. 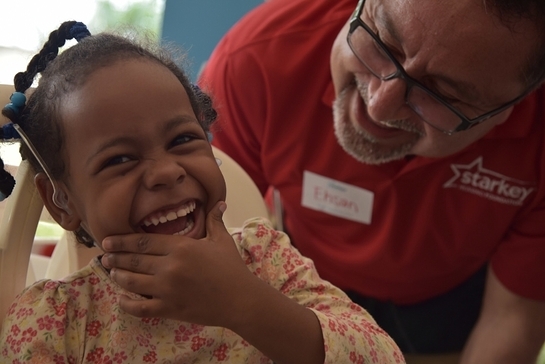 In the Dominican Republic, Starkey Hearing Foundation, working with its strategic partners, has held eight hearing missions, distributing more than 37,000 hearing devices so that individuals of every age can receive the gift of hearing and the power of caring.